This fastback is a true “freak” in the world of 50 year old Mustangs! 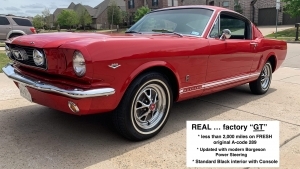 Very high integrity body with NO metal replacement that I can see …….. this is freakishly RARE for a 50 year old Mustang. Still has its ORIGINAL 50 year old Red Oxide PAINT on the entire surface of its untouched original floors … this may be the only 50 year old Mustang you will ever see with floors this original and pristine. Body ….. may be one of the best original bodies I have seen in the last 40 years of being involved with these cars. The first place you look when examining these cars is at the floors and rear quarters. This body could be a “bench mark” for originality. Paint …. It will “wow you” every time you go in your garage. The paint is super slick and has that deep, wet, high gloss look. There is very little evidence of use. While not flawless, it’s as nice if not nicer than the vast majority of “show drivers” out there. NO notable scratches, dings or road rash. Only under close critical examination can you even tell that there are three or four minor chips that have been touched up. Mechanically …. Please take time to watch the TEST DRIVE VIDEO. 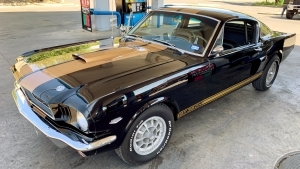 The car performs as would be expected of a well maintained vintage 302 J-code GT Mustang ….. it will get it. It starts easily, idles good, runs good and pulls good under hard acceleration and stops good. It did not exhibit any bad habits during my test drive. The motor has apparently been rebuilt at some point in the past but I have no idea as to how many miles its been driven since. The odometer currently shows 2,068 miles (NOTE: actual miles are not known and given that it is over 25 years old I am required to sell as miles EXEMPT). The car was treated to a “major full service” less than 500 miles ago which included among other things the following. OTHER possible Upgrades or CHANGES ???? 1) Replacement exhaust system …. WHAT would you like? Please note that the existing exhaust system is old and in need of replacement. We prefer to let our buyer have a say in his preference for a stock type “2 into 1” transverse system or a modern true dual system. Replacement is INCLUDED in the “BUY IT NOW purchase price” of the car, or we will lower the price by $500 and let you install the system yourself. 2) Your CHOICE of the Tire/Wheel configuration. No additional cost involved in this change. 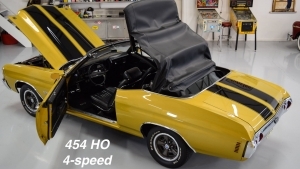 Most of the photos show the 14” Magnum 500 wheels with raised white letter tires, however if you prefer the OEM original 14″ “GT” wheels ….. OR, possibly spec your own tire wheel configuration. 3) Detail the engine bay. The engine bay still sports its original paint, both on the inner fenders and on some of the mechanical components. It is very impressive for a 50 year old engine bay, however it “lacks the wow factor” of the rest of the car. We will detail the engine bay with the engine in the car to be more impressive than its current state, but not to a show quality level (which would entail removal of the engine). Add $1,000 to the purchase price as this is labor intensive. 4) Update brake lights to bright LEDs. Add $400 to the purchase price. 5) Convert Bench Seat to Bucket Seats (I prefer it as is). Add $1,500 to the purchase price. 6) Add an original 1968 Console / only if bench seat converted to buckets. 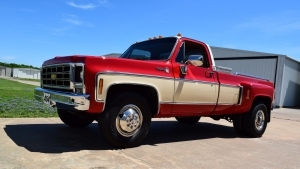 Add $2,000 to the purchase price, (plus the $1,500 above for the restored bucket seats conversion). There is a lot involved here (Parts and Labor) and the parts are NOT reproduced for the 1968 so we use “quality” rare original components. 7) Update existing radio to be iPod and Blue tooth capable, OR replace existing radio with a modern system. 8) Add sound deadener insulation though out the vehicle all the way through the trunk. This requires removal of entire interior including door panels. Add $800 to the purchase price. 9) Convert existing Power Steering to modern power steering using the BOGERSON system. Budget $2,000 to $2,200. 10) Modern AC/heat …. The existing AC and heat system on this vehicle is currently working. However many of our buyers prefer to have these 50 year old problem plagued systems to be replaced with new technology. We use VINTAGE AIR’s system which has been perfected for this exact car. Budget $3,000 for this upgrade. * ….. other possibilities ??? NOTE While none of the ABOVE upgrades or changes are necessarily needed, this is typical of what my son and I offer to our buyers, many of which are overseas. We take a car that is already very nice and enhance it to an even higher level. Our goal is NOT “perfection”, rather our goal is to rationalize the car as needed to get it to the best operation and best presentation possible without “breaking the bank”. 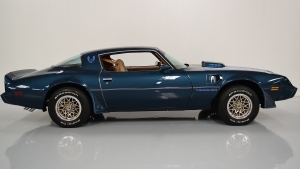 This is a very special car that is not only FUN to drive and be seen it, but it also represents an excellent investment that has a high probability of continuing its long history of appreciation. 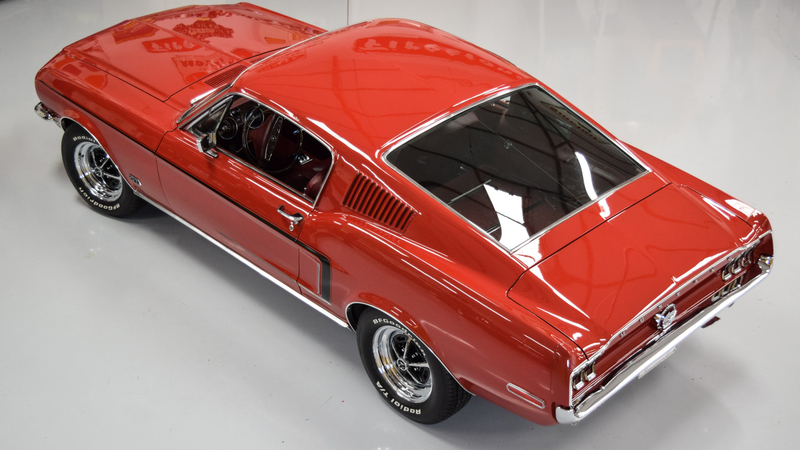 The color, options, performance and the quality of the body and paint separate this fastback from the pack. If this is the one you have been waiting for, or you have questions, please note my PHONE NUMBER is embedded in the last photo. If you would like to inquire about this car just fill out the form below to send us a message! Click here to sign up for our email update! Sign up to receive an email whenever we post a new blog! Click here for more about us.